Willow Run Board President Sheri Washington runs a special meeting held by the board Tuesday where Laura Lisiscki, principal at Kaiser Elementary School, was appointed acting superintendent for the district. Nov. 4, 2009 · 1:59 a.m. 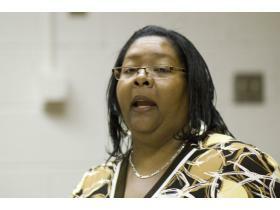 The Willow Run Board of Education will see two new faces at its regularly scheduled meeting Thursday. The board voted unanimously in two appointments, an acting superintendent for the district and an open board seat, at a special meeting Tuesday. Laura Lisiscki, principal at Kaiser Elementary School, will temporarily take over at the district’s top position, while Don Garrett, a 1990 Willow Run graduate and local minister, will fill the seat former board vice-president Harold Wimberly left on Oct. 5. The board met in closed session to discuss the appointment of Lisiscki, who is also the president of the administrator’s union. Trustee Clifford Smith said he originally intended to abstain from voting for Lisiscki due to concerns the effect her absence from students’ education would have at Kaiser, and because she leads the administrator’s union. Clifford said he changed his mind after it was clear from the closed-door meeting that Lisiscki would be the “acting” superintendent, not the “interim” superintendent, which would have implied more permanency. Willow Run Superintendent Dr. Doris Hope-Jackson was recently in a severe car accident and has been unable to regularly attend board meetings, according to Wimberly. He told the Citizen on Monday she was hospitalized after the accident and is now recovering at home, but remains largely confined to her bed. It is unclear when she may return. Board President Sheri Washington said she was comfortable with appointing Lisiscki as acting superintendent and felt it was the best arrangement for the district. “I do agree it is very noble to desire that our principals are in their building, but it’s even more imperative that we have a superintendent in our school district and someone to hold the responsibilities and duties of that office,” she said. Board Secretary Mark Wilde concurred. “This is an acting position which means it’s short-term,” Wilde said. “To have (Lisiscki) out of the school is not a major issue. Following Lisiscki’s appointment, Garrett was selected out of three candidates to fill Wimberly’s vacated seat. Each candidate was presented with one question from each board member and two from Washington – ranging from specific scenarios to more general interview questions. Board members rated candidates’ answers on a scale from one to five, with five being the highest. The candidate with the greatest point total at the end of the interviews won the position. Washington was pleased to see Garrett fill the open position and called him an “earnest and honest man” whose whole family has deep roots in Willow Run. “He has all the qualities you want to see in a male role model today,” she said. When Washington asked Garrett why he wanted to sit on the board of education at Willow Run, he replied that after a positive experience as a student 20 years ago, then after seeing the present situation, he wanted to help. Washington said the board would have to choose a new vice-president. Garrett will run in a general election in May to try to win the remaining year in Wimberly’s term. Wimberly tendered his resignation to the board in an Oct. 5 letter in which he cited an “overbearing” board of education and “unprofessionalism” in the district as main reasons for his early departure.